This article examines the Chinese state’s interactions and influences on the development of non-governmental organizations (NGOs) through a corporatist framework. It suggests that not only is the central state actively involved in the development of NGOs, but increasingly the successes of NGOs are determined by their interactions with the local state. We profile NGOs in Shanghai, of varying sizes, budgets, and issue-areas, as a case study to understand the interplay between NGOs and the local state. 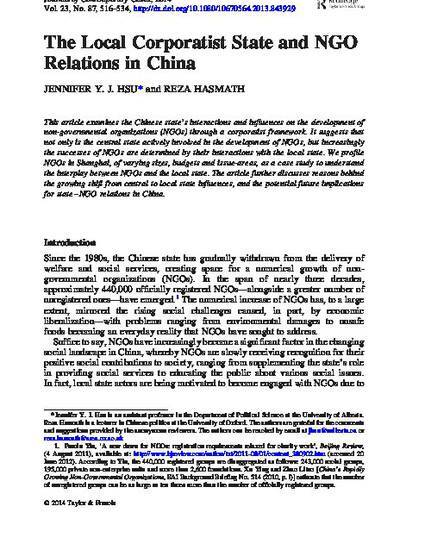 The article further discusses reasons behind the growing shift from central to local state influences, and the potential future implications for state-NGO relations in China. Hsu, J.Y.J. and Hasmath, R. (2014) "The Local Corporatist State and NGO Relations in China", Journal of Contemporary China 23(87): 516-534.